2)You can provide the readings to your GP to help him monitor your condition and assist him with determining your medication dosage. 3) Getting one or two readings in a doctor’s surgery will not be as accurate as taking your own blood pressure a few times every day over a month. 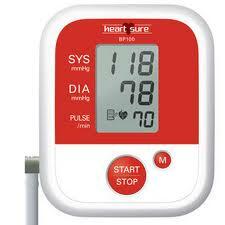 4) ’White coat hypertension’ can produce blood pressure readings higher than usual. This is because some people (up to 20% of the population) get nervous when they visit the doctor and this raises their blood pressure. If you are relaxed and in your home environment, taking the readings yourself, then you are more likely to get a more accurate reading. This means you are less likely to be prescribed medication for your ‘high’ blood pressure in the doctor’s office. There are aneroid and digital home blood pressure monitors. The aneroid ones are like the one your doctor uses and include a stethoscope. Although cheaper than digital they are not as easy to use as the digital ones. I suggest that you consider buying a digital monitor. The digital ones include upper-arm and wrist type models. They also have either an automatically inflating cuff (the piece that goes round your arm or wrist) or a manual cuff where you pump the cuff up by squeezing a bulb. Digital monitors are the most popular for home use and range in price from $30 to $200 depending on the features. Caffeine, alcohol and tobacco will affect your blood pressure. Wait at least 30 minutes after consuming them before you check your blood pressure. Your left arm should be placed on a desk or table at the level of your heart. Blood pressure varies between the right and left arm so use the left arm every time for consistency in readings. Once the cuff is around your arm and fitted correctly turn on the machine. In an automatic model the cuff will inflate when you push a button. Manual models require you to pump up the cuff using a rubber bulb that you squeeze. After inflation the cuff will slowly lose pressure automatically. Check the display. 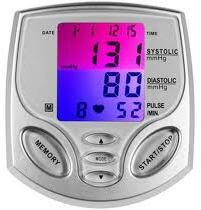 The monitor will show your systolic and diastolic pressures. Write them down (or store them in the unit’s memory), systolic over diastolic, e.g. 120/80 On some monitors you will press the exhaust button to allow the cuff to release and on others the cuff releases automatically once the reading is done. If you want to check your readings a second time, wait 3 minutes before repeating the procedure.